58222 Annunciation Annunciation (1447) Tempera on wood, 167 x 137 cm Galleria degli Uffizi, Florence. 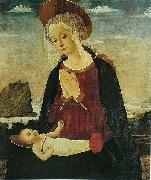 58301 Our Lady of sprouts mk261 Florence 1460-1470 egg tempera in wood 94.5 x 83 cm. 58221 Portrait of a Lady in Yellow Portrait of a Lady in Yellow, 1400s, The National Gallery of Art, London. (October 14, 1427? ?August 29, 1499) was an Italian early Renaissance painter. Baldovinetti was born in Florence to a family of a rich merchant. In 1448 he was registered as a member of the Guild of St. Luke: "Alesso di Baldovinetti, dipintore." He was a follower of the group of scientific realists and naturalists in art which included Andrea del Castagno, Paolo Uccello and Domenico Veneziano. Tradition says that he assisted in the decorations of the church of S. Egidio, however no records confirm this. These decoration were carried out during the years 1441 - 1451 by Domenico Veneziano and in conjunction with Andrea del Castagno. That he was commissioned to complete the series at a later date (1460) is certain. In 1462 Alesso was employed to paint the great fresco of the Annunciation in the cloister of the Annunziata basilica. The remains as we see them give evidence of the artist's power both of imitating natural detail with minute fidelity and of spacing his figures in a landscape with a large sense of air and distance; and they amply verify two separate statements of Vasari concerning him: that "he delighted in drawing landscapes from nature exactly as they are, whence we see in his paintings rivers; bridges, rocks, plants, fruits, roads, fields, cities, exercise grounds, and an infinity of other such things," and that he was an inveterate experimentalist in technical matters. His favourite method in wall-painting was to lay in his compositions in fresco and finish them a secco with a mixture of yolk of egg and liquid varnish. This, says Vasari, was with the view of protecting the painting from damp; but in course of time the parts executed with this vehicle scaled away, so that the great secret he hoped to have discovered turned out a failure. 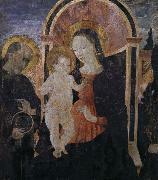 In 1463 he furnished a cartoon of the Nativity, which was executed in tarsia by Giuliano de Maiano in the sacristy of the cathedral and still exists. From 1466 date the groups of four Evangelists and four Fathers of the Church in fresco, together with the Annunciation on an oblong panel, which still decorate the Portuguese chapel in the basilica of San Miniato, and are given in error by Vasari to Piero Pollaiuolo. A fresco of the risen Christ between angels inside a Holy Sepulchre in the chapel of the Rucellai family, also still existing, belongs to 1467. In 1471 Alesso undertook important works for tile church of Santa Tr? ?nita on the commission of Bongianni Gianfigliazzi. First, to paint an altar-piece of the Virgin and Child with six saints; this was finished in 1472: next, a series of frescoes from the Old Testament which was to be completed according to contract within five years, but actually remained on hand for fully sixteen. In 1497 the finished series, which contained many portraits of leading Florentine citizens, was valued at a thousand gold forms by a committee consisting of Cosimo Rosselli, Benozzo Gozzoli, Perugino and Filippino Lippi; only some defaced fragments of it now remain.